Using data-driven methods to grow and engage your audience will set you apart from the vast majority of content creators out there. In this post, we’ll cover a method of using Google Analytics to grow and engage your audience by analyzing your AARRR visitor/customer funnel. Whether you’re aware of it or not, each visitor to your site falls into your AARRR funnel at one of these levels. Each level of the funnel has its own complexities and inner workings, but this is the big picture for your online business. Here we’ll see how you can use your traffic data to quickly know what you need to be focusing on right now to grow an engaged audience. We’ll be using Google Analytics demo data from the Google Merchandise Store as an example along with a Data Studio report I’ve put together. 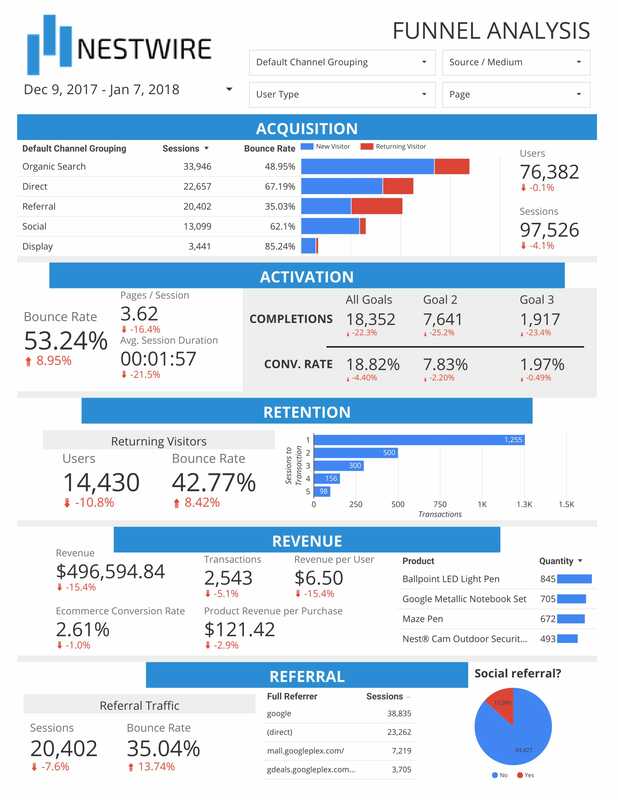 You can get a copy of this report and connect your own Google Analytics data by getting this free Data Studio template (opens in a new window). Setup takes just a few clicks and you’ll be on your way. A side note: This guide assumes that you have at least some traffic to begin with. After all, you can’t make data-driven decisions without data. The whole point of analyzing your data this way is to find the best ways to nudge people down your AARRR funnel. We separate each level of the funnel into distinct parts in order to focus on specific areas that we can improve. But the reality is that each level of your funnel is interconnected with the other levels. Yes, you want to attract more traffic by focusing on improving your acquisition metrics, but you want engaged traffic that translates into strong numbers in your activation metrics. Active users are then easier to turn into return users, which will be reflected in your retention metrics. In turn, it’s easier to turn someone who knows something about you into a paying customer (revenue metrics) who then brings in other people by sharing your content (referral metrics). You need to work towards creating a plan that operates on all levels synergistically. We’ll illustrate a few ways to approach this. First, take a holistic view of your customer funnel. In our example of the Google Store, the first thing that jumps out at me is that while the number of Sessions and Users is up (more than 17% gains over the previous month for each), activation and retention stats are mediocre at best, and revenue (and all related metrics) is way down over the previous month. Click the image to enlarge in a new window. So, this particular site seems to be bringing people in fairly well, but getting them to be active, return users and converting them into paying customers isn’t going so well. Right away, I can see that this means I need to focus on ways to improve my numbers in the middle parts of my funnel — activation, retention, revenue. In this example, I’ll be focusing on increasing activations (email engaged users, registrations, etc) since that’s the highest level of my funnel that needs improvement. First, we can drill down a little further with data filters to get a clearer picture of exactly what we need to be focusing on to do this. You can use the Default Channel Grouping filter at the top of the report to see which acquisition channels lead to better metrics for all levels of your AARRR funnel. You might find that one channel does better than the others up and down your customer funnel. Great — focus on optimizing that channel until your efforts plateau, then look for new opportunities. Or, you might find that one channel does better at engaging and activating your traffic (say, through downloads or email signups), and another does better at bringing in repeat visitors (i.e., retention). That’s fine too. You’ll need to come up with a content strategy that focuses on each channel to some degree. In the example report, if I want to increase activation/engagement on the site, a good place to start is by focusing on where the most engaged traffic is already coming from. In the Acquisition section of the report, I notice that referral traffic has the lowest Bounce Rate in the Default Channel Groupings table, which is the first indication that this might be a good channel to target for more engaged traffic. If I filter the report to only include referral traffic, sure enough, I can see that this type of traffic has a very low bounce rate (21.51%), gets almost double the average number of Pageviews/Session (7.97 compared to 4.33 overall) and has a Conversion Rate for registrations that’s nearly 3 times as high as the overall average (4.5% compared to 1.67%). These data suggest I should focus on attracting high-quality referral traffic over other methods like SEO and social in order to get more active users on my site. There’s really no point in pouring your time and effort into a new social media platform or SEO if those channels don’t bring in the kind of traffic you need to grow an engaged audience. If these channels bring in more traffic and that’s your goal, then that’s fine. Just keep in mind that simply getting “more traffic” isn’t always the answer. If you’re just starting out, by all means, try lots of different things, but keep an eye on your data so you can quickly shift your efforts to things that are paying off in terms of engaged traffic. The key is to not get too bogged down on any single metric and instead think in synergistic terms. Use these same principles while you apply more filters to your data and drill down deeper. For example, which referral Source/Medium has the best-performing metrics for your goals? Once you identify the top performers, you can devise an action plan to reach out to those types of platforms for backlinks, guest blog posts, etc. in order to increase high-quality, high-converting traffic. You might also look at how well different Pages perform with respect to your goals. If there is a specific topic you write about or a certain type of content that has led to a lot of conversions in the past, for example, think of ways to incorporate related content into your campaigns. If you want to focus only on getting engaged new visitors or only on re-engaging return visitors, you can add a User Type filter and see which channels and types of content do well with each group. Again, each level of your customer funnel has its own set of complexities to consider, but this example should give you a new way to look at the big picture of your online business. Hopefully, you can see that by looking at just a few important metrics — and how they relate to other metrics — you can easily and quickly make smart, data-driven decisions about your business without wading through a bunch of complex reports. You now have a single-page report that you can use as a starting point whenever you’re not sure what you should be doing to grow, engage, and convert your audience. If you still haven’t got it yet, click the button below and get started analyzing your data.